Carey Bleak Peters, her husband Pete and teenage son Danny, who is on the autism spectrum, have moved back to Bleak Harbor from Chicago. Carey is descended from the founder of the town but her mother, the reclusive Serenity Bleak, is the sole heir to the family fortune built up over the years. She has no interest in her grandson and no plans to pass her fortune on to Carey or her brother Jonah, the mayor of Bleak Harbour. Both Pete and Carey are struggling with unresolved and potentially dangerous work related issues. In fact, most of the characters, and there are a good many introduced along the way, have issues of one sort or another and none of them appear to have many principles. When Danny disappears Carey and Pete want to believe he’s gone walkabout as he has before, but then they both begin to receive odd and sometimes ominous texts. Carey twists her phone around her neck for Pete to see. There’s a new text, this one with a photograph. A hard-backed chair stands in a pool of shadow. One the seat is an object the color of dull silver. Maybe a roll of tape. What starts off as a seemingly obvious case of kidnapping with a demand for an extremely large ransom, quickly morphs into something much more complex, with surprise twists and possible suspects coming thick and fast as the plot develops. Bleak Harbour is a town with many undercurrents and secrets, and it’s described extremely well. The characters are flawed, not particularly likeable but they drive the plot, and as efforts to find Danny escalate the darkness at the heart of the town begins to surface. The only redeeming feature is Carey’s desire to protect her son. Suspicions are raised and actions questioned but each trail seems to lead to a dead end. A bit like my guesses about the perpetrator. The reveal is something I would never have guessed. Perhaps it was a little farfetched but nevertheless I enjoyed the read very much. The diverse characters are well depicted, especially Danny. I don’t know much about the effects of autism but Danny is as individual as any of them, with his own distinct personality and doesn’t seem to be just defined by his condition. Bryan Gruley is a new to me author but now I’m looking forward to catching up with previous books and reading the Starvation Lake trilogy. 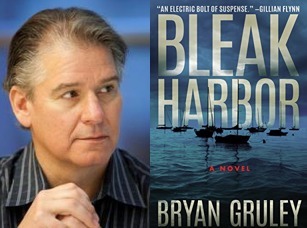 Bryan Gruley is the award-winning author of the forthcoming BLEAK HARBOR, about the kidnapping of an autistic teenage boy. He previously authored the critically acclaimed Starvation Lake trilogy, including Edgar finalist STARVATION LAKE, THE HANGING TREE, and THE SKELETON BOX. When he’s not making stuff up, he’s a staff reporter Bloomberg News and Bloomberg Businessweek magazine. The former Chicago bureau chief of the Wall Street Journal shared in the Pulitzer Prize given to the Wall Street Journal in 2002 for coverage of the September 11 terrorist attacks. A graduate of Notre Dame, avid hockey player and amateur musician, he currently lives with his wife, Pam, in Chicago. This sounds terrific! I’m adding it to my to-read list now. Thank you.